Thank you to everyone who helped raise an estimated $93,330 for therapy! In a noon drawing at the Easterseals Rehabilitation Center today, officials announced that 1, 816 tickets were included in the 2019 Easterseals Home Run Sweeps ALL CA$H Raffle drawing. Tickets were $100 each and a maximum of 3,000 were available. The official ticket sales period began January 2 and ended just before today’s drawing. The drawing had been postponed from the original date of March 14 due to low ticket sales. Mary Heim of Evansville won the grand prize of $50,000 at today's drawing. Mike Siebert of Jasper, Indiana won the $25,000 second prize. Kaitlyn Jochim of Haubstadt, Indiana won the $10,000 third prize. This year’s ticket sales surpassed last year’s sales of 1,683 tickets. Easterseals estimates net proceeds from this year’s Home Run Sweeps ALL CA$H Raffle will reach approximately $93,330. Those funds will underwrite physical, occupational and speech therapy sessions for local individuals with disabilities who couldn’t otherwise afford these life-changing services. This year's amount brings the 28-year total raised by the Sweeps to approximately $3,193,836. Officials from Kemper CPA Group verified all tickets and witnessed today’s random drawing. Easterseals Board Member Ken Smith picked the winning tickets from the raffle bin. 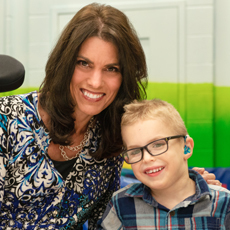 Easterseals Adult Ambassador Michelle Schmitt of Evansville, Indiana shared her story with audience members, and the event was emceed by Aaron Santini of 104.1FM WIKY. Sponsors of the Home Run Sweeps are Kemper CPA Group, WEHT Local, Local 7 WTVW, 104.1FM WIKY, HOT 96, 93.5 The Lloyd, and WABX 107.5. Indiana Raffle License Number for this event is #148801. Please click here to view the official rules. For questions about today's drawing results, please contact Carolyn Franklin, Director of Special Events, at 812.437.2607 or CFranklin@evansvillerehab.com. For media inquiries, please contact Pam Kirk, Director of Marketing and Community Relations at 812.437.2626 or PKirk@evansvillerehab.com. Please note this information was updated on 3/29/2019 to change the number of tickets included in the drawing from 1,806 to 1,816. The increase represents the inclusion of 10 tickets that were offered as incentives throughout the raffle. Those incentives were "Early Bird" (chance of one ticket); "Beat the Deadline" (chance of one ticket); "Extra Innings" (chance of one ticket); "Hope Day" (chance of three tickets); and "Super Sam Days" (chance of three tickets). The last name of the second prize winner was also changed from "Seibert" to the correct spelling of "Siebert".